Incredibles 2 Disney Pixar’s recent 3D animated movie & sequel to The Incredibles. Compare to live-action movie animated film is remarkably different. Everything needs to create from scratch and the process is longer, also production time for an animated movie takes years. For this sequel movie approximate 52,725 storyboards created. Roughly 410 storyboards created for above Sequence only. This particular scene is the opening action sequence of the movie featuring The Incredibles trying to stop the Underminer from robbing a bank and making an escape. Concept Art comes after storyboards are complete and the storyline is solidified to satisfaction. This is where the film’s production designer and art department create the look and feel of the film. This concept art ends up in what is called a color wall, giving an idea of the visual progression and evolution of the film. But since Incredibles 2 was bumped up to an earlier release, there wasn’t a color wall on display. After the concept art is finished, the next step is to have the technical artists build the basic shapes that will form the sets and characters that will be animated later. This process is called modeling. After that, artists begin what is called shading painting characters and sets, applying textures, patterns and other material properties to make what’s seen on screen start to look a little more realistic, at least relative to the style of the production. The image above comes from the overall process known as layout. A virtual camera is placed into a shot in order to give animators an idea of how this particular scene will be constructed. During this process, the characters are placed into the positions they’ll be in within the virtual set. You’ll see that the characters aren’t yet put into any discernible pose, because that comes in the next step. Once the camera angle in a given shot is determined and the characters are placed in the environment, it’s up to the animation department to bring those characters to life. You’ll see that the characters are now in action, posing as they will be seen in the shot. In order to recreate the characters as realistically as possible, animators use video reference of themselves, sometimes the voice actors, in order to make the character movement genuine. During this process, characters have their facial expressions and body movement completed. Typically, it takes Pixar four to six weeks to complete animation for a single shot. In this particular case, the composition of the characters in this shot was so complex that the animation department needed eight weeks to finish it. But you’ll notice that the environment around the characters still lacks definition and the shot doesn’t feel complete. That comes in the final step. In the final part of the process, lighting and various effects are applied to create the fully realized image. The lighting involves creating virtual light sources to illuminate the characters and the set, just as a real life crew would do on a live-action film set. The lighting is placed in areas that will naturally call attention to what filmmakers want the audience to pay attention to. It also helps create a certain mood and tone for any given scene. Once the images have been lit, they’re rendered at high resolution. 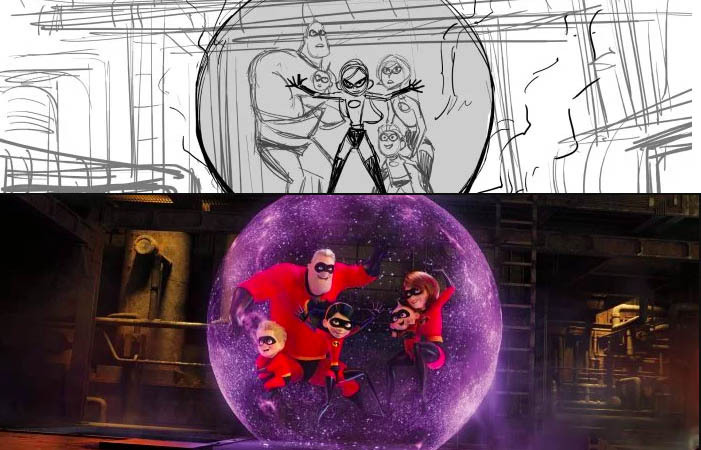 Each frame of Incredibles 2 has over 2 million pixels, and there are 24 frames for each single second of the movie.